ttf to dxf,vector,symbol,dxf,convert,font,cad text editor,cad,arx AutoCAD Text Editor - Convert TTF words and symbols into DXF. 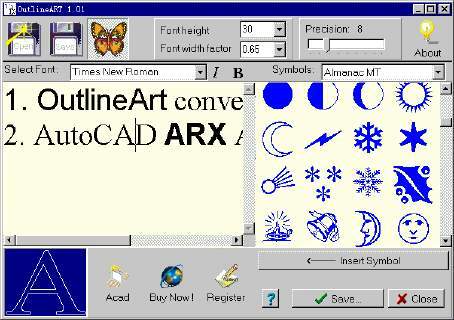 AutoCAD Text Editor - OutlineART,applied in CAD wordprocessing,is a tool to transform words and symbols into vector-contour,we provide both windows desktop version and ARX embedded version for AutoCAD(supporting R14 and R2000/2002/2004/2005/2006),so that words and symbols can be transformed into not only DXF file,but also polyline entity in AutoCAD.Main Features Of OutlineART:Inputting words and symbols to be transformed . Opening an existed file . Setting up word attributes You can set up font of words and symbols,wordheight and height/width ratio(DXF only) . Setting up smoothness of vector contour . Saving inputted words to txt file for future use . Saving to DXF file . Easy in use.